Renascence means rebirth, and in the case of Kandia Kouyaté, one of Mali’s most celebrated traditional singers, the music of rebirth comes as a welcome surprise. Kouyaté is a jelimouso, a female Mande griot singer whose work involves singing the stories and praises of heroes, past and present. Kouyaté was long ago recognized as an ngara, a master of this hereditary art. Born in 1959 in Kita, she rose to prominence in the 1980s on the strength of spectacular performances in ceremonial settings and privately circulated cassettes of those appearances. Her exceptional fame was not based simply on her marvelously blooming and confident voice, but also her knowledge of history, and the way she interwove these two skills to fulfill the ancient role of the jelimuso as few living singers could. Given all that, for many years, there seemed no reason for her to bother with the exigencies and humiliations of the recording industry. Persistent entreaties from the late Senegalese record producer Ibrahima Sylla at last inspired Kouyaté to enter a studio and record her landmark 1999 CD Kita Kan. It was a tour-de-force, breaking ground in a number of ways, including the use of an orchestral string section backing the traditional instrumentation of ngoni, kora, balafon, guitar, keyboards, percussion and backing vocals. Three more CDs followed, up to 2004. Then Kouyaté suffered a devastating stroke. She barely spoke and did not sing during much of her seven-year recovery. Few thought they would ever hear from her again. But once again, a visit from Sylla in 2011 convinced Kouyaté to record. Sylla himself did not live to hear the result. He died in 2013, leaving his daughter Binetou Sylla to complete her father’s remarkable parting gift. These 10 tracks absolutely maintain the high standard Kouyaté set with her earlier studio work. From the lush orchestration of “Koala Boumba,” sung for her Kouyaté ancestors, and “Sadjougoulé,” a meditation on her illness and recovery, to the spare kora and vocal feature “Dakolo,” in praise of a Malian philanthropist who died too young, there is marvelous variety track to track. “Kassi Doundo (The Crying Rooster)” features guitar and low ngoni weaving dark harmonies over a rolling 12/8 groove. And “Mogoya Douman (A Beautiful Relationship)” offers pentatonic praise to a Fulani patron from Biriko, the ancestral village of Kouyate’s mother. “Konoba Doundo (A Large Bird)” showcases ngoni and kora buoyed by the Western string section. Kouyaté is remembering her late great-aunt, another ngara, Batafin Soumano. Soumano was wife of writer/politician Fily Dabo Sissoko, who was close to Mali’s first president Modiba Keita, but who then fell out with the leader and died in prison in 1964. Politics and traditional society intermingle intriguingly here, and the music is sublime. François Bréant serves as the principle arranger for this ambitious session. He adds at times prominent, though tastefully varied, keyboard elements to most of the mixes. 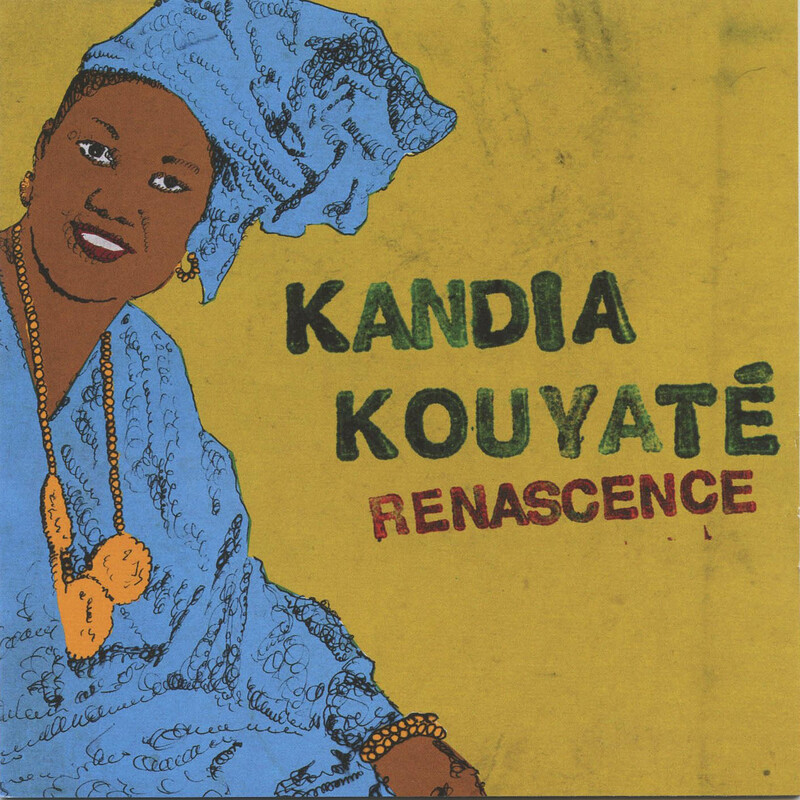 But of course, the crucial question: has Kouyaté recovered her iconic voice? And the answer is, for the most part, yes. It sounds more deeply pitched, a little more weighty, with a waver here or there, but surprisingly uncompromised and full of the graceful nuances of tone that have always made Kouyaté such a joy to hear. On the lengthy concluding piece, “Camara Donfoli (The Dance of the Camaras),” she returns to basics, working over a modest vamp of ngoni and meandering balafon and delivering fast volleys of half-spoken words driven by intent and passion. Kouyaté’s historical narration honoring the Camara family suggests that this ngara still possesses her deepest powers. Of course, it is difficult for an outsider to assess the most specialized aspects of the griot’s rarified art. But the bottom line, and the core of this entire tradition’s social significance, comes down to this: “If you know where you come from, you will know where you’re going.” And thankfully, Kandia Kouyaté is going forward.